Top Notch Material: Meet Mr. Eatsalot, our new Tummy Stuffers friend! Meet Mr. Eatsalot, our new Tummy Stuffers friend! 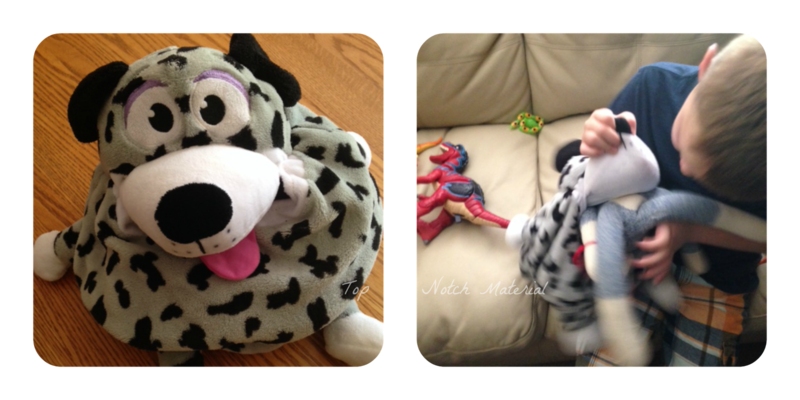 My little boys love all things stuffed! Seriously, if you saw the amount of stuffed animals my 7 year old sleeps with you would be amazed! His baby brother is following suit with him and now loves stuffed animals too. We recently received a Tummy Stuffers for review, and this is just perfect! When you stuff Mr. Eatsalot, which is actually the Dalmation on the Tummy Stuffers site, with smaller stuffed animals, he make a perfectly comfortable pillow and takes up less room! I love Mr. Eatsalot because it is now a fun way to get my boys to pick up their mess. "BOYS! Why don't we see who can fill up Mr. Eatsalot up fastest?" It turns evening pickup into a fun game! You can even order a JUMBO Tummy Stuffers to pick up even more stuff!! Our Tummy Stuffer is incredibly soft and plush, and wonderful to cuddle up to! At only $19.99 plus shipping and handling, this is in the perfect price range for birthday parties for little ones! It is readily available for purchase in Target, Toys "R" Us and Kmart, or can be ordered online with a free mini stuffer!! Be sure to check out Tummy Stuffers on Facebook to stay up to date on their latest products!